Stephanie Smothers, a suburban over­achiever played by Anna Kendrick with spunky energy and self-effacing deflection, is the widowed mother of a son in elementary school. Into her life steps Emily Nelson (Blake Lively), a sleek urban professional with no maternal instincts––like a high- society shark forcibly moved from her hunting ground to a tranquil aquarium tank. 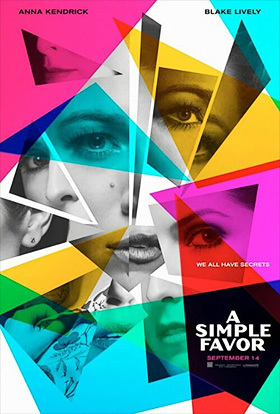 Their odd relationship is the core of A Simple Favor, a neo-noir of suburban pep and middle-class warmth meeting cool sophistication. Playdates, cocktails, and dark secrets are shared. Paul Feig, director of Bridesmaids and the distaff Ghostbusters remake, switches from ensemble comedy and improvised gags to dry wit and sparring wills. Stephanie's household tips and comfort food and cheery homilies camouflage unrequited longings. Emily's chic fashion sense, afternoon martinis, and cutting remarks hint at a ruthless hostility beneath her ceaseless smirks. All they have in common are sons who've become buddies and an inability to connect with other parents—enough to bond them as BFFs. When Emily suddenly disappears, Stephanie's amateur homemaking vlog morphs into a true-crime podcast and she turns into Nancy Drew, delving into the dark past of her enigmatic friend. It's gets complicated, of course, in the twisty way of these kinds of things. The plot (adapted by Jessica Sharzer from Darcey Bells' debut novel) leans on unlikely twists and one trope so corny and convenient it borders on ironic (or so the filmmakers hope). There's a Greek chorus of neighborhood gossips that plays the social satire for too-easy humor, but Kendrick and Lively are well matched and their sparring is delicious. For all of Emily's cruel jabs passing as girl-talk, Stephanie she is eager for her friendship and acceptance, not because of her friend's high-toned taste and designer style, but because Emily pulls Stephanie out of her comfort zone of chatty niceties and polite poses. Kendrick plays off her chirpy good-girl image as Stephanie's mothering instincts turn more intimate—after Emily vanishes she moves in with her friend's grieving husband (Henry Golding) and her repressed desires come out to play. The balance of humor and mystery is well-handled for the most part. Stephanie's chipper vlog commentary is a clever substitute for the traditional private eye voiceover, while the jukebox score of Serge Gainsbourg songs and '60s French pop tunes adds playful energy to the chic style. Director Feig is not a cynical fellow; for all the deviousness at play in the final act, there's flippancy in his gallows humor. He can't fully embrace the dark side of his cold-blooded schemers or the cool strength Stephanie discovers in her journey. His actresses, however, are more than up to the task (Golding not so much, due at least in part to an underwritten role) and while they can't elevate the material to Gone Girl dimensions, they give this cocktail a satisfyingly tart twist.